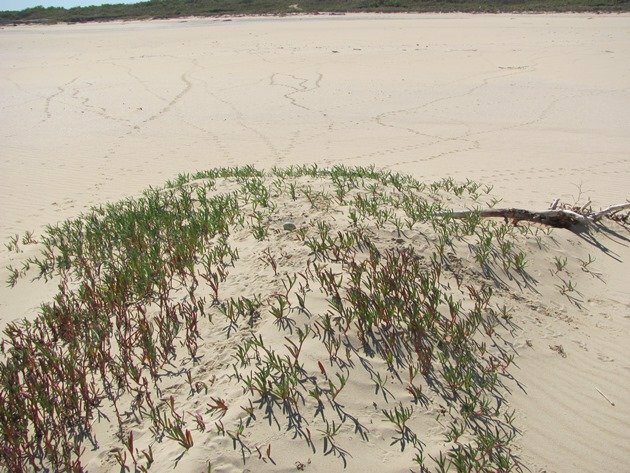 Since discovering our first Pied Oystercatcher nest on Cable Beach in July 2000 we have observed the breeding of these local shorebirds along the coast between Gantheaume Point in the south and Willie Creek in the north, which is a distance of 23 kilometres. There are sixteen pairs of Pied Oystercatchers and they have varying success at raising young birds. To the north they are very unlucky with predation before the eggs even hatch out, but to the south the eggs hatch out and then the predation occurs on the chicks. In any breeding season we are rarely observing more than one young Pied Oystercatcher reach independence from its parents and some years none succeed. Thankfully with the longevity of this species it appears the population is fairly stable, but this may not always be the case if predation continues at the rate that it is. 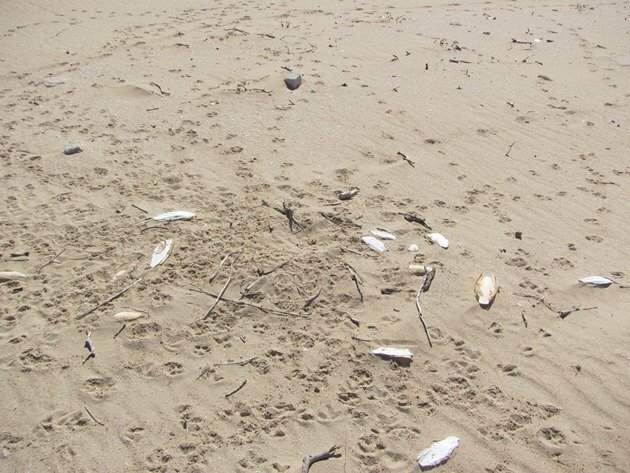 The main problem appears to be feral cats, but there is also predation from birds of prey and the parent Pied Oystercatchers do their utmost to protect their young. A normally quiet species, that walks a lot more than it flies, takes on a whole new role once it has laid eggs. 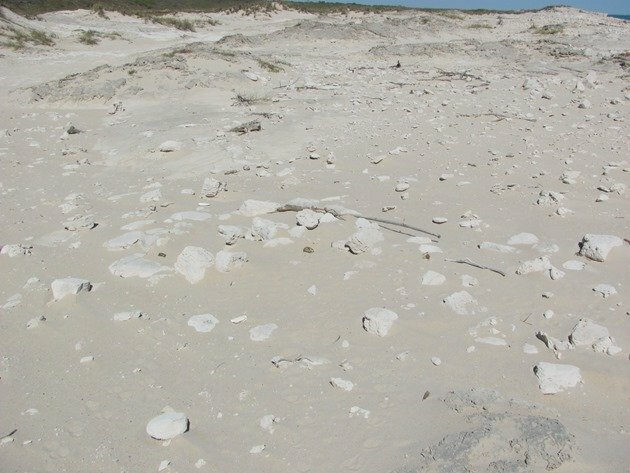 From our observations, the Pied Oystercatchers nest each year along this section of coast in the first week of July, which is our winter. The day-time temperatures are still around 32c, but the night-time temperatures are cooler than in our summer months and the humidity is lower. 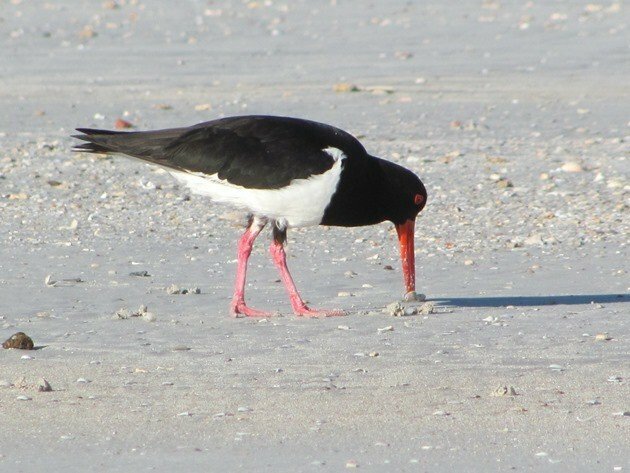 The male Pied Oystercatchers generally make the nest scrape and once the female Pied Oystercatcher is content with his work she will lay one egg. This initial egg is not necessarily sat on until the second egg is laid and then almost continuous egg sitting will take place for 28 days. On very rare occasions three eggs are laid, but this is very uncommon and there have been instances when the last egg is completely white. It has however hatched out, so the colouring has not affected the internal structure of the egg. Over the years we have proven that not only do Pied Oystercatchers not remain with their same partner, but are also prepared to give up their territory in certain instances. Only a long term study will show this sort of information and we have also noticed how different individual Pied Oystercatchers react to different situations. Each Pied Oystercatcher pair will nest in a different environment along the coast and even adapt to higher tides later in the season after egg loss. Where there is limited food the Pied Oystercatchers have larger territories and where food is abundant they are within closer proximity to each other. Our most successful pair of Pied Oystercatchers over the years have been paired together for some years now. They were previously successful parents with other partners and they inhabit Gantheaume Point for much of the year. Last year they successfully laid three eggs and they successfully raised three chicks, which is the only record that we are aware of in the local area. The chicks finally all dispersed by the end of the year and in July there were two eggs laid in the usual nest site. 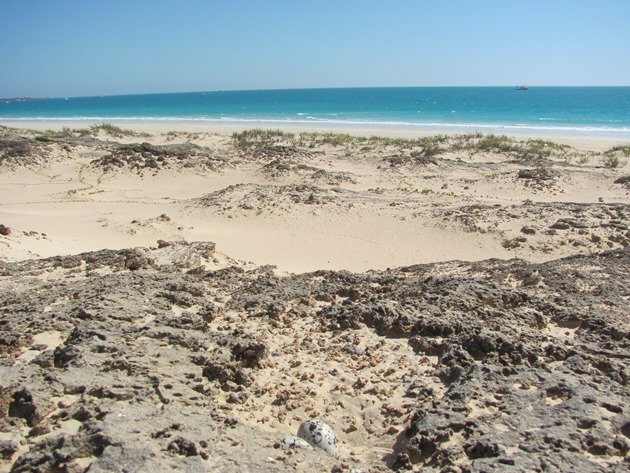 They are very specific where they nest and it is the same place year after year on a rocky outcrop overlooking Cable Beach with a short flight to Gantheaume Point for food off the reef. Twenty eight days of sitting produced two fluffy Pied Oystercatcher chicks that were well camouflaged among the rocks. Nobody could approach the area without a reaction and the Pied Oystercatcher parents flew constantly at birds of prey which were soaring the thermals along the coast. 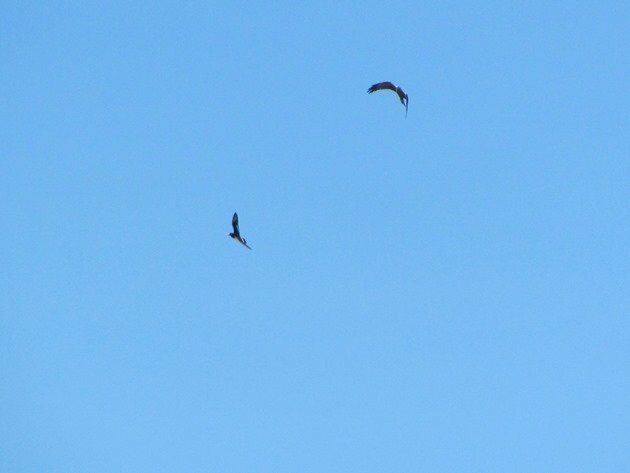 For the majority of birds of prey both parents would take to the sky and would persist in the chase until the bird was completely out of the area. For birds that rarely fly they were suddenly constantly in the air. 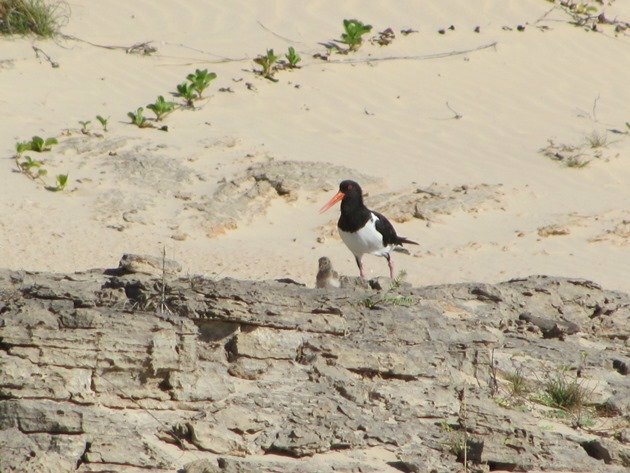 This particular pair of Pied Oystercatchers have a strategy that involves walking their young two kilometres to the reef at Gantheaume Point when they are only a few days old. They then hide the young in the reef and there is ample food for them as the tides come and go. 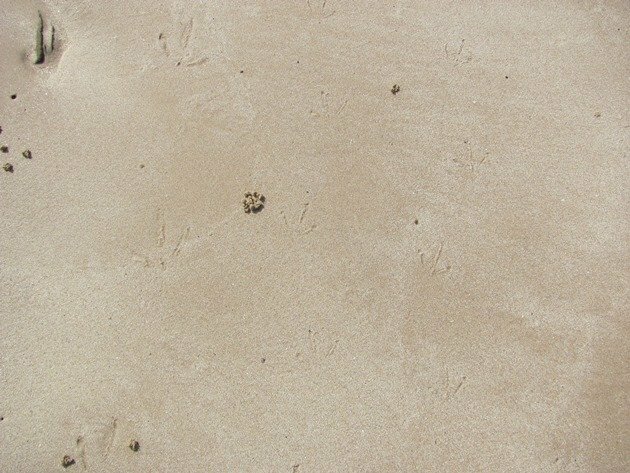 It is extremely hard to approach the area to check on how many chicks are surviving without getting some sort of reaction and the easiest way to confirm the number is to look for tracks at the high tide line. A reaction by the adult Pied Oystercatchers in the form of a lot of vocal calls indicates the presence of chicks, but the number can remain a mystery among the rocks. Sadly this pair of Pied Oystercatchers have been silent for a few days now and they no longer have their chicks. 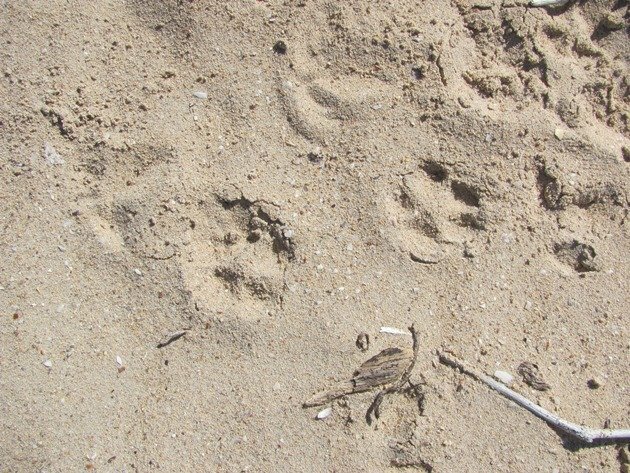 We are unsure of the exact predator, but there are cat prints in the area. They will nest again in approximately ten days like in previous years. 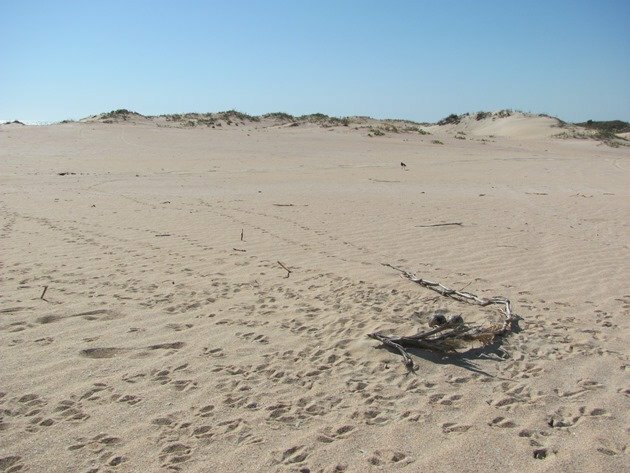 The exact same situation has happened to the next pair of Pied Oystercatchers to the north, who laid two eggs in the first week of July and the eggs hatched out twenty eight days later. They lost one chick almost straight away and there was evidence of the second chick surviving for a few days and then it was also lost. 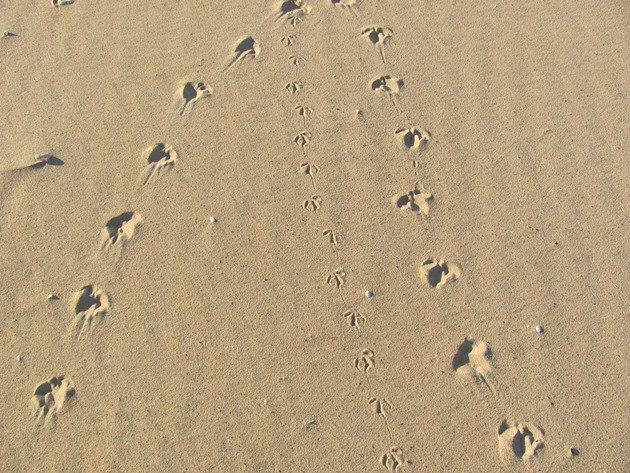 The Pied Oystercatcher chick had walked between its parents at high tide leaving its tiny mark in the sand. 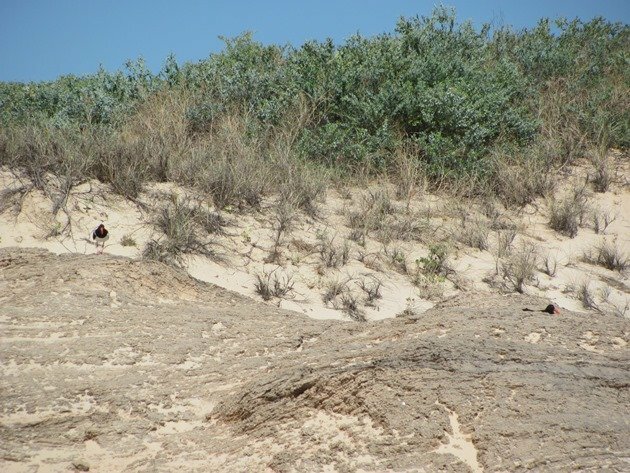 The pair of Pied Oystercatchers have recently laid two more eggs in the exact same nest site with excellent views over Cable Beach. They take it it turns to sit on the eggs and the other guards from a nearby rock at high tide and will feed alone once the tide drops enough for it to find food. 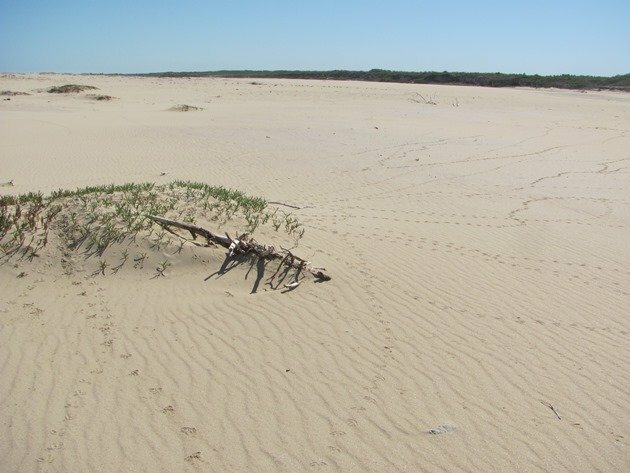 Further to the north in the “nudist area” of Cable Beach the pair of Pied Oystercatchers have been even more unlucky this year. They lost their first two eggs very fast and then set about making more scrapes to decide where to lay more eggs. 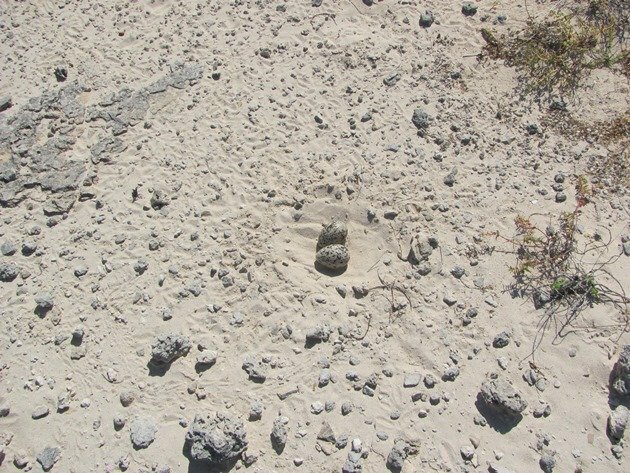 They did not move too far from the initial site and the eggs were soon lost again. Now they are attempting for the third time and they have moved further north and chosen a more open area where hopefully they can keep an eye on predators more easily. They are away from most of the traffic and closer to the reef. The last time they successfully raised a chick was in 2012. It is the same situation further north with the pairs of Pied Oystercatchers losing their eggs to predators. 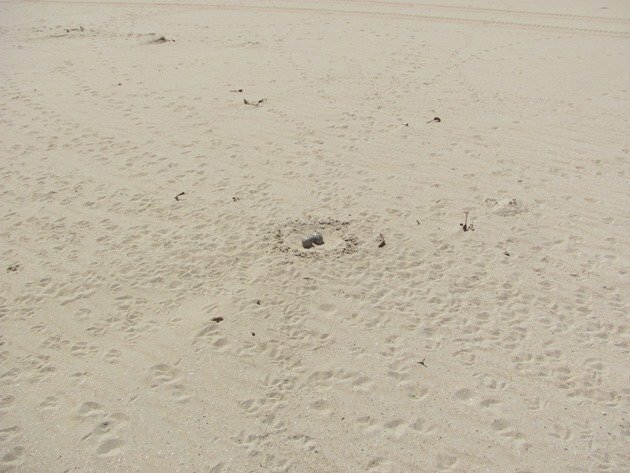 One pair started with a nest close to shore and lost their eggs and they then chose an area inland from the coast and hopefully a safer place. They have not been successful since 2011. 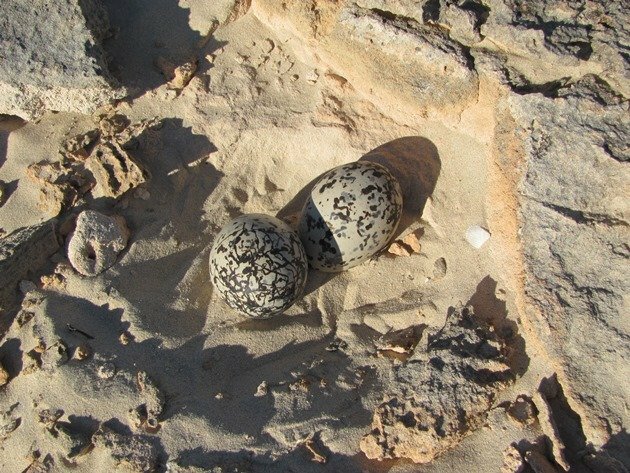 Predation of Pied Oystercatcher eggs by feral cats appears to be a bigger problem to the north than to the south and we have had occasions where we have seen nest after nest raided and no remaining eggs where there had been numerous on the last visit. 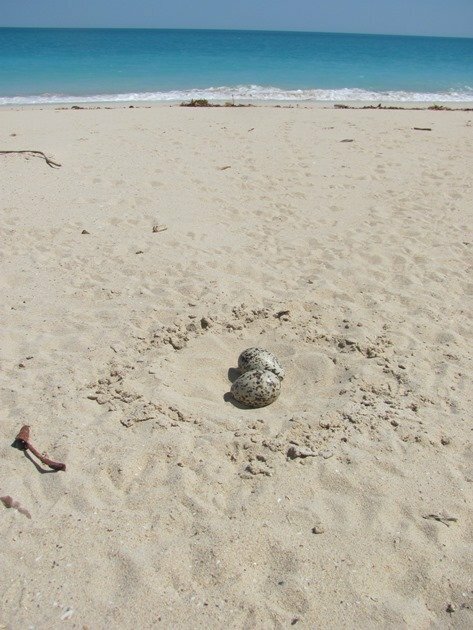 One thing the Pied Oystercatchers may have against themselves is the fact that they always walk into their nest sites and maybe this does attract some attention. They are almost constantly sitting on their eggs and a large black and white bird does not camouflage well. They don’t always choose sites that are safe from the high tides and the eggs do on occasion get wet. 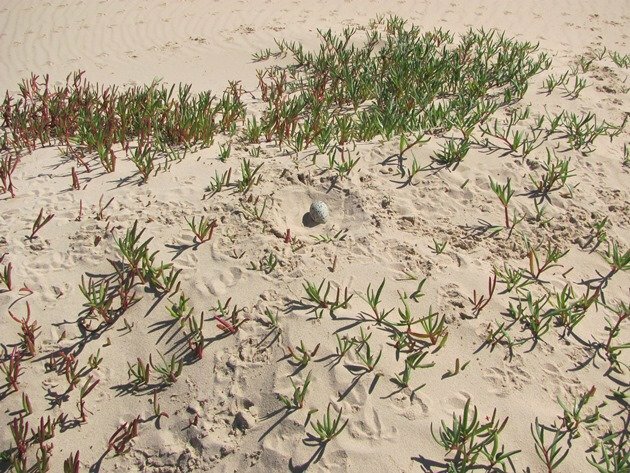 We have observed eggs get wet during a high tide, but they have still hatched out because they have floated and been protected by the adult birds. 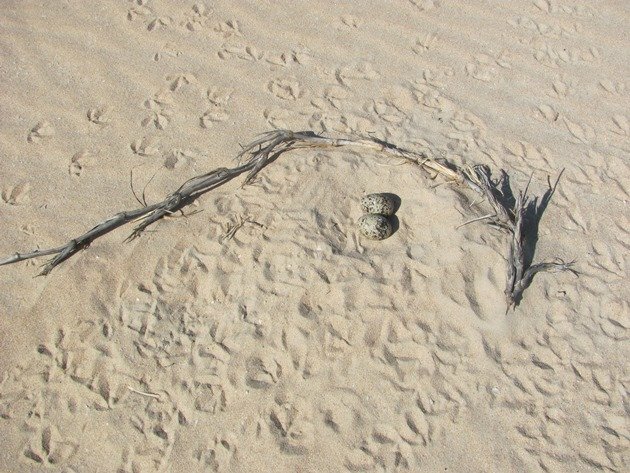 We don’t like to interfere with the nesting process, but there has been an occasion recently when after much egg loss a pair of Pied Oystercatchers chose to nest extremely close to the high tide mark and also where potential four-wheel drives may drive and crush the nest site. 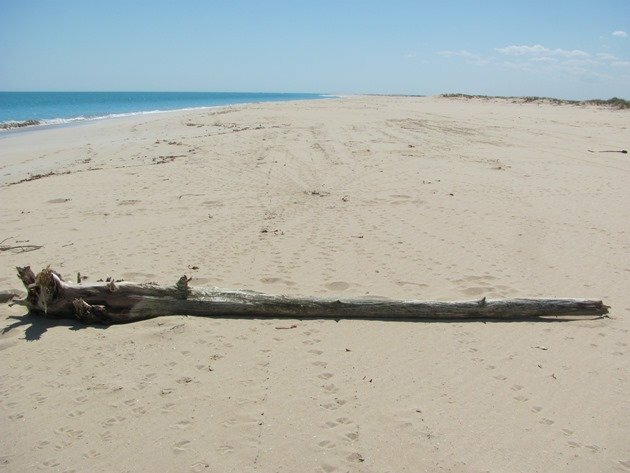 The high tide was less of a problem, but the availability of a large piece of mangrove tree that had washed in meant that we could hopefully protect the nest from vehicles. The Pied Oystercatchers watched us move the log from near their nest to block the area that may be used by vehicles and then returned to their nest. It has been a very slow start to the breeding season for Pied Oystercatchers along this stretch of coast so far, but we are hopeful that we may possibly see a young Pied Oystercatcher learn to fly before the end of the year. The odds are not good, so we continue to wait twenty eight days for eggs to hatch and then wait ten days every time eggs are lost for more eggs to be laid. It takes between thirty five and forty two days for a Pied Oystercatcher chick to learn to fly, so we are a long way off yet. If there is breeding success by any of these sixteen pairs of Pied Oystercatchers this year you will all hear about it! Where Are You Birding This First Weekend of December 2018?